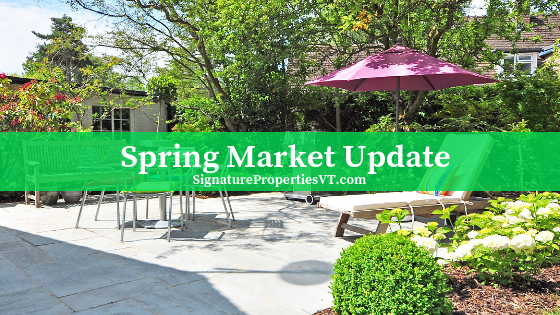 We are about two years into a national trend of decreased housing supply and increasing average sales prices. Of course, there are exceptions to this rule, but the market is shifting predominately in favor of home sellers. This is great news for homeowners, and home sellers, as property values continue to rise along with demand. 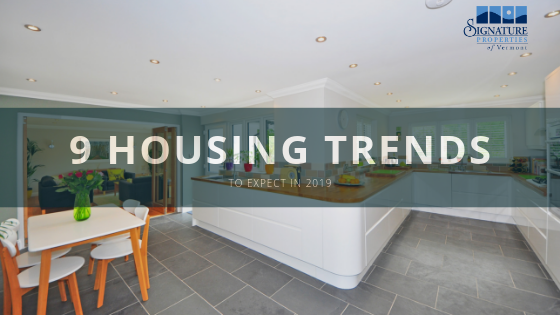 Purchasers will be happy to hear that interest rates have remained low, but are expected to creep up in the year to come. We've seen dozens of multiple-offer situations over the summer, which makes having a realtor on your side crucial to negotiate the best price and terms for your sale or purchase. With a market this aggressive, having a professional working on your behalf is more important than ever. 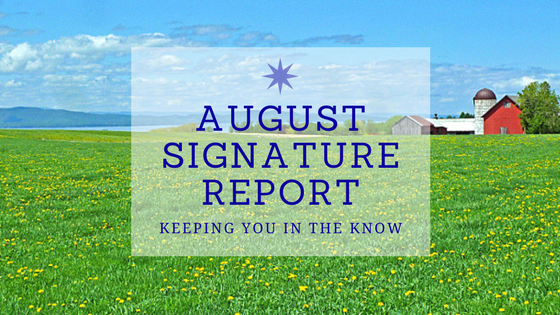 With an increased demand for homes the average amount of time a property spent on the market in August continued to decrease. This is especially true of homes listed by a licensed real estate agent as they're more widely visible to potential purchasers. Not only are homes selling quickly, but the multiple-offer situations referenced above can drive the sale price up. 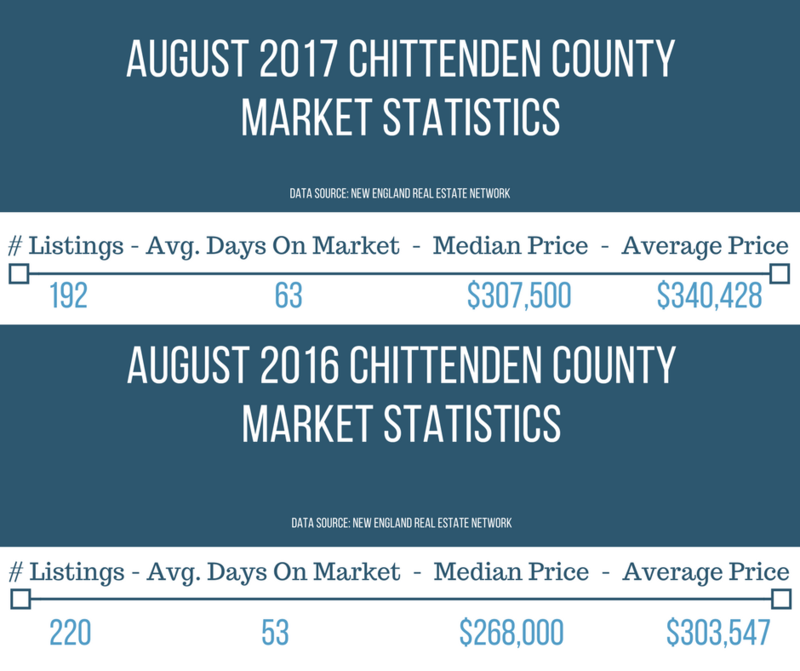 As pictured in the graphs below, the number of available listings this August is down 15.6% from last year at month's end. Most notably however, is the substantial jump (over 12%!) in sales price from this time last year, netting sellers nearly $37,000 extra! These statistics are based on homes sold with the assistance of a trained professional; according to a recent study, homes sold without the help of a realtor net substantially less, and spend more time on the market. 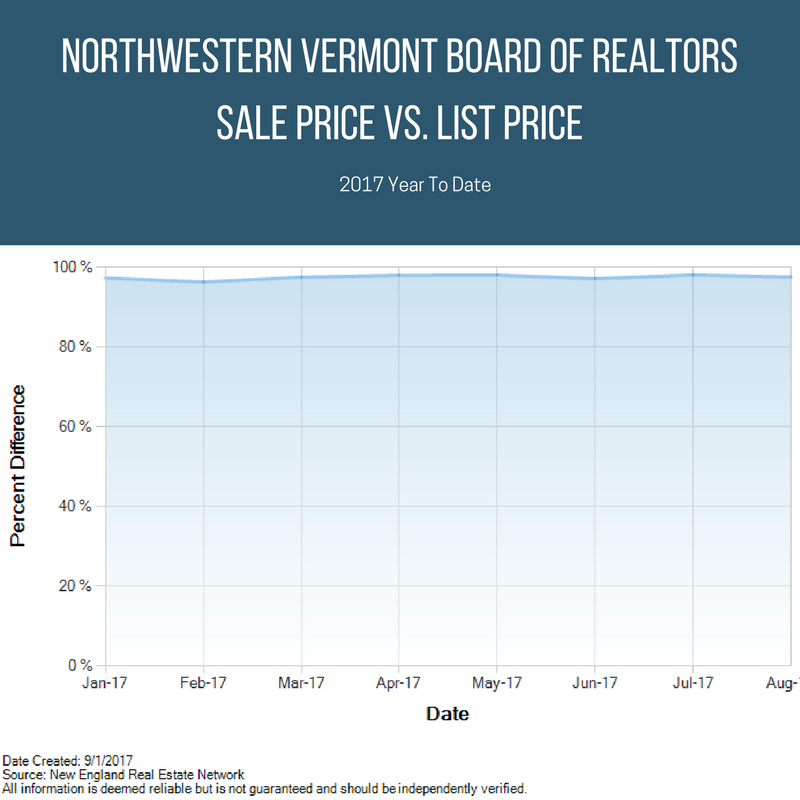 Below you'll find two charts comparing the average sales price versus list price of properties sold so far in 2017. 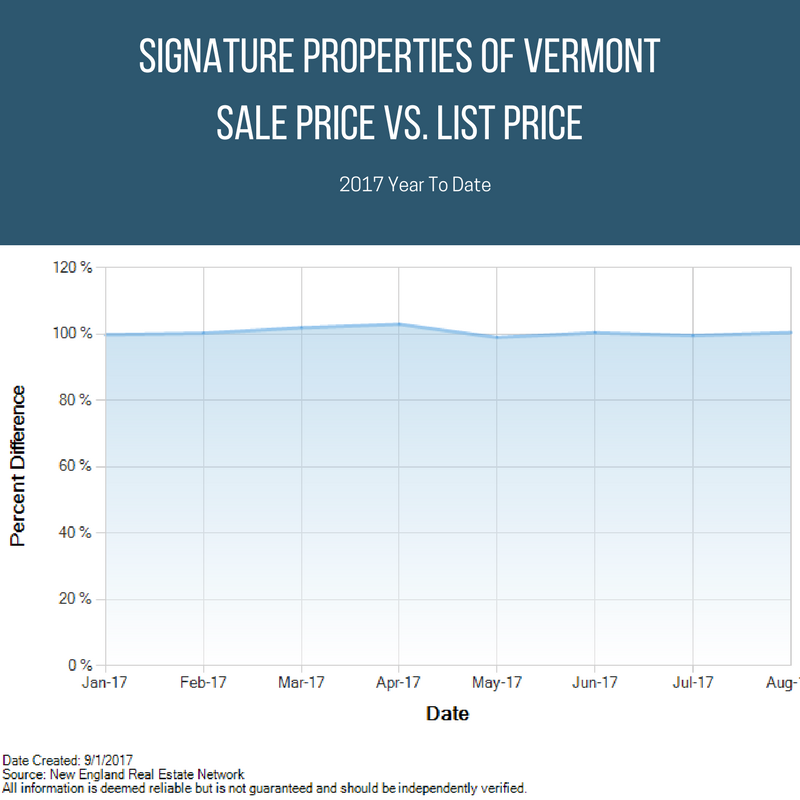 As you'll see, month over month, Signature Properties of Vermont realtors are able to achieve or exceed our sellers' expectations. 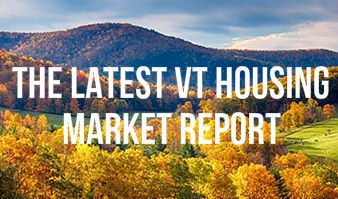 Signature Properties of Vermont boasts slightly higher results than competing firms with our sellers receiving 100% of their asking price, on average. 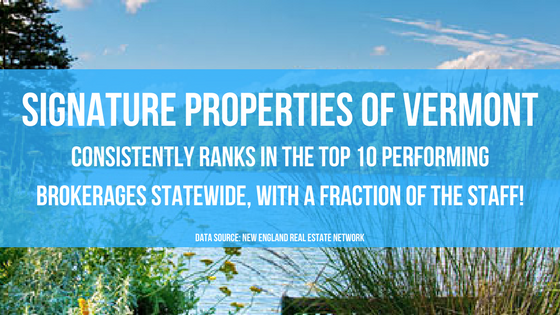 We're proud to once again be in the top 10 performing brokerages this month, and year to date! It is important to us as a company that we maintain a small, productive team which allows us to handle each transaction with the personal attention and care it deserves. At Signature Properties, our clients, and their properties, are treated with the utmost respect. We'd like to think that our consistently high ranking reflects the time and attention we work to provide. As always, if you have any questions about your home, or the market in general, please give us a call! We are thankful to be your real estate resource. Make sure your listing reaches Millennial home buyers! Is it starting to sound as though reaching this generation is more trouble than it's worth? Don't be fooled. Although many Millennials are choosing to rent, they have substantial buying power and studies show that they by and large still value home ownership. Media rooms - Millennials are more 'plugged in' than any other generation. 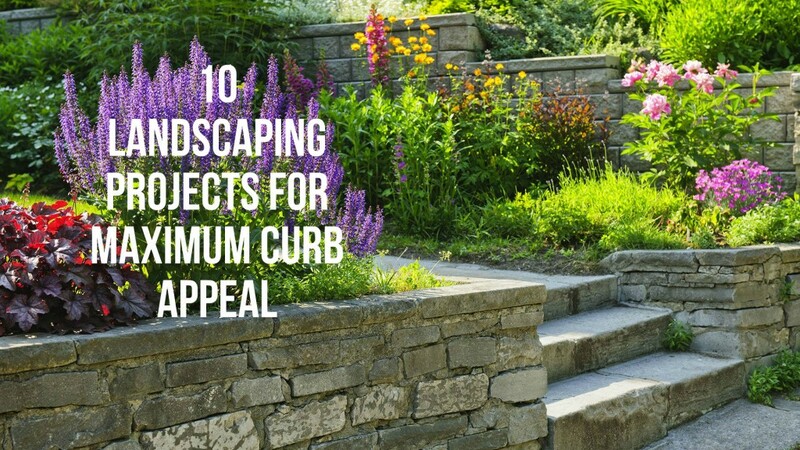 Be sure to highlight any tech-savvy features your home has to offer. Marketing these features will help get the attention of this generation. For many Millennials, the neighborhood they live in matters just as much--or more--than the house they buy, and they're looking to meet a specific need. This generation is extremely technology driven and are used to receiving information instantly. This translates to the amount of time they are willing to spend getting from point A to point B. Make sure to point out how close your home is to all attractive amenities - especially if your property is located in the heart of town. Extra bonus points if you're within walking or biking distance to recreation, schools and shopping! It is no secret this generation is environmentally-conscious, and they'll be looking for homes that have green features. Make sure to highlight any recent upgrades - especially new windows and energy efficient appliances. Modern homes are popular choices for younger buyers, but your house doesn't need to be brand new or designed by a minimalist architect to appeal to this generation. 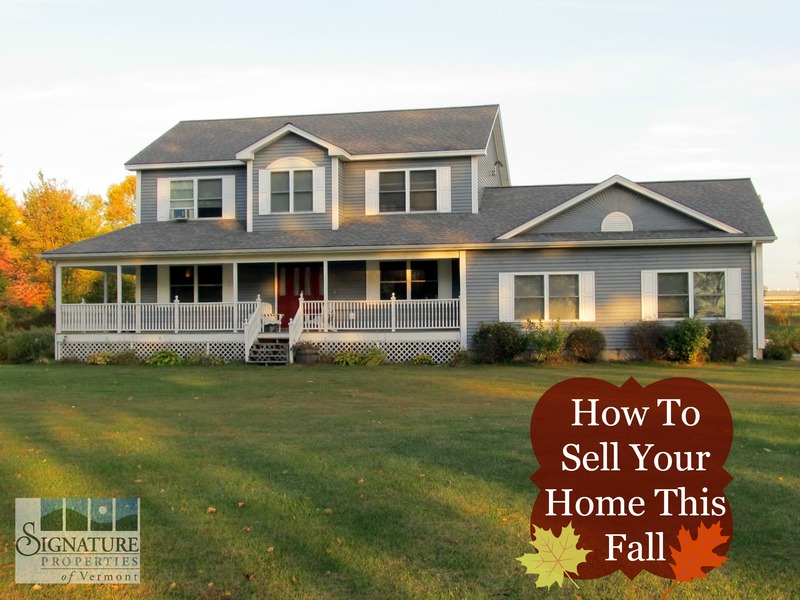 Some simple home staging before your showing or open house could be all you need to bring in an offer. Take the 'less is more' approach and eliminate clutter (this applies to all generations as well!). To find younger home buyers, you'll have to place your ads where they will see them, and that is largely online. Social media is an ideal place to advertise your property in a way that won't seem pushy or aggressive. 60% of Home Buyers are swayed by school district choices. Kids are housing game changers. Growing families face new and often unfamiliar concerns. The home that once was comfortable for a couple can soon become overcrowded as little ones grow. Children also bring up other concerns for parents including neighborhood safety and educational opportunities. A recent study by realtor.com found that 3 out of 5 buyers say school boundary lines were a deciding factor in their purchase decision. Buyers were also shown to be willing to give up other luxuries and go above and beyond to secure their children seats in premier classrooms. Vermont is fortunate to boast a 90% high-school graduation rate-one of the nation's highest! Realtor.com now offers a search by school district function. Have a school in mind? 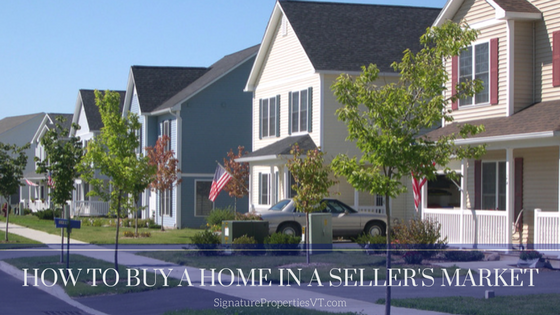 Contact a Signature Agent to help find a home in that area!